Billie's surprised when Leo brings home a fellow Marine from boot camp, Denny. 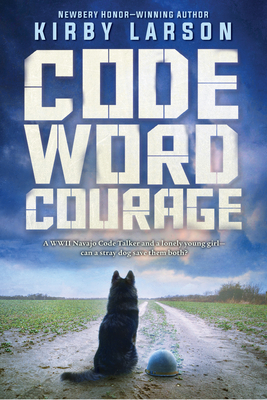 She has so much to ask Leo -- about losing her best friend and trying to find their father -- but Denny, who is Navajo, or Diné, comes with something special: a gorgeous, but injured, stray dog. As Billie cares for the dog, whom they name Bear, she and Bear grow deeply attached to each other. Soon enough, it's time for Leo and Denny, a Navajo Code Talker, to ship out. Billie does her part for the war effort, but she worries whether Leo and Denny will make it home, whether she'll find a new friend, and if her father will ever come back. Can Bear help Billie -- and Denny -- find what's most important? A powerful tale about unsung heroism on the WWII battlefield and the home front. Kirby Larson is the acclaimed author of the 2007 Newbery Honor Book Hattie Big Sky; its sequel, Hattie Ever After; The Friendship Doll; Dear America: The Fences Between Us; Duke; Dash, winner of the Scott O'Dell Award for Historical Fiction; Liberty; Code Word Courage; Audacity Jones to the Rescue; and its sequel, Audacity Jones Steals the Show. She has also co-written the award-winning picture books Two Bobbies: A True Story of Hurricane Katrina, Friendship, and Survival and Nubs: The True Story of a Mutt, a Marine, and a Miracle. She lives in Washington with her husband and Winston the Wonder Dog.